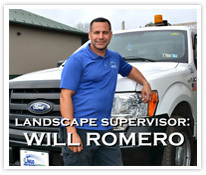 Lingo Landscaping strives to separate itself from other landscaping companies. We do this by working with the client, envisioning and designing a professional design and finally presenting an accurately itemized proposal that includes everything necessary to make those dreams come true. • At the initial site meeting, the landscape designer will note any relative lifestyle aspects of the client-family and follow up with an accurate site analysis relative to the proposed project. • Depending on the scope of the project being considered, the designer can forward pictures of past projects with a detailed proposal for review by the client. • In most cases, a two-dimensional landscape plan is completed to illustrate our thoughts and better explain what is being proposed. This requires multiple site visits, follow-ups and open communication with the client. • Upon the client’s commitment to the project, the work is scheduled. Our Irrigation, Lighting and Landscape division managers will confer to coordinate the crews and complete all preliminary tasks. • Plant material, hardscape materials, irrigation supplies and equipment are transported to the site following a PA One Call. Careful consideration is taken so as not to infringe upon the efficiency of those already working on site, such as builders, electricians and plumbers. • Landscaping is a seasonal, weather-related industry. Lingo always strives to adhere to a pre-determined schedule. Occasionally delays are inevitable, but we are committed to completing the project in an efficient and timely manner. • Our crews will do everything possible to minimize the inconvenience our work has on the client’s daily routine by keeping the project site orderly. This process is the basis for the company’s success. 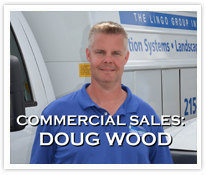 The Lingo Group utilizes the best form of advertising, by “word-of-mouth”. Client recommendations and personal testimonials have propelled The Lingo Group to the forefront of the landscaping-irrigation industry in the Philadelphia area. This is why you can be assured your experience with The Lingo Group will reflect the dedication and quality that so many have experienced since 1982.